Good news for animal lovers and vegans! 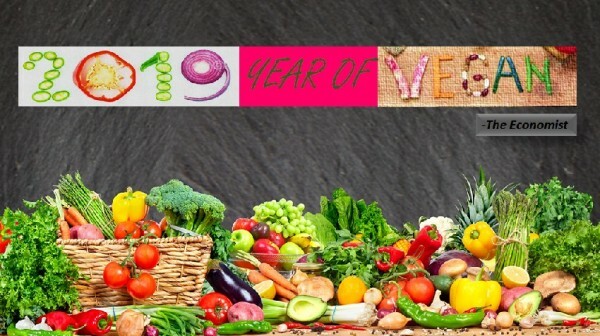 As per the report released by The Economists in its annual “The world in 2019” magazine Year 2019 is going to “the year of the vegan”! 2019 Year of the vegan for various good reasons! In its report The Economists cited that 25% of United State population in the 25 to 34 old demographics name themselves as vegan. The number of vegan population is growing worldwide. Thousands of popular individual restaurants and restaurant chains are including vegan dishes in their menu. Popular chains like McDonald’s and TGI Fridays have introduced vegan and plant-based food options in their menu and has become popular. Whole foods and Kroger of US both are promoting plant-based foods and Kroger predicts vegan foods will be one of the tip five food trends. Number of schools and hospitals are required to offer vegan food as the demand for plant-based food is increasing with awareness health benefits of vegan diet. American Medical Association urged hospital to have and serve more plant-based foods. In fact, many well-known meat companies (e.g. Tyson company) are holding equity in vegan brands as the popularity and demand for vegan food is overwhelmingly increasing! In US alone sales of vegan foods rose ten times within 6 months period (January to June 2018). Over the past decade vegan diet has seen consistent growth due to millennials and vegetarians who decided to eat only plant-based food. Earlier this year NBC reported that Google searches for vegan is increased by 33% in 2015-2016. Veganism in US has increased by 600 percent since 2014! The growth is global because, many countries including Canada and Australia also find a big jump population that adopted veganism. In Australia vegan products sale increased 92 percent since 2014. According to author John Parker “Interest in a way of life in which people eschew not just meat and leather, but all animal products including eggs, wool and silk is soaring, especially among millennials” Generation Z, those born between 1995 and 2005 are more into plant-based foods than earlier generation! Both generation Z and millennials are responsible for an increase in percent of vegan diet growth in past decade. As this generation grow and start families, it is expected growth in veganism. Similarly, plant-based proteins production also to make up third of the global protein market in upcoming years. Vegan milk product sales had risen 9 percent compared to earlier year and reached $1.6 billion. In addition, vegan cream, vegan cheese sale increased 43%. Bakeries are moving away from egg cakes to vegan cakes as the taste is as good as egg-based cakes. This is a great news not just for plant lovers but also for all animals who suffer from unbelievable cruelty of humans – chained, filthy cages, mutilations, slaughtering! New year around the corner and if you want to feel best with your health it is time to switch to plant based food. Plant based foods offer lot of health benefits and it is proven. There are thousands of healthy recipes available and changing to healthy plant-based foods will help us to be guilty and cruelty free life.